The study by Hylek et al examined the tolerability of warfarin among an elderly inception cohort with atrial fibrillation (AF) and found the rate of major hemorrhage to be higher than previously reported. In their patient population (n=472), 32% were =80 years and represented the elderly inception cohort. Hylek et al found almost a 3 fold increase in the rate of major bleeding in their elderly cohort (n=153) as compared to their younger cohort (< 80 years; n=319): 13.1 major bleeds per 100 person years in the elderly vs. 4.7 per 100 person years in the younger cohort, P = 0.009. Also, Hylek et al found that the risk of stopping warfarin on the basis of safety concerns (bleeding complications, falls, coagulopathy, dermatologic reaction, nonadherence to drug monitoring) peaked in the elderly cohort at roughly 30days from warfarin initiation compared to a peak at roughly 90 days in those <80 years of age. However, after 6 months, this risk in the elderly approximated that observed in the younger cohort. Other reports also have described an increased rate of bleeding recently. 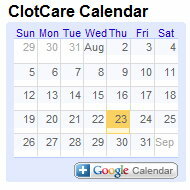 An investigation by Kucher et al.1 reported an increase in major bleed over time for patients on warfarin therapy in their institution, but they attributed this increase to the combination of antiplatelet therapy and warfarin, and risk factors for bleeding found in their patient population including hypertension and prior stroke1 (see http://www.clotcare.com/clotcare/warfarinbleeding.aspx). The study by Flaherty et al.2 found a significant increase in warfarin-related intracerebral hemorrhage from 1988 to 19992 (see http://www.clotcare.com/clotcare/reducewarfarintreatment.aspx). They also noted that two-thirds of the warfarin-related intracerebral hemorrhages occurred in patients > 80 years of age. However, risk factors for bleeding complications were not addressed in their patient populations2. In addition, an increasing body of evidence supports age as an independent risk factor for bleeding. In fact, in examining the relationship between age and other risk factors to the incidence of bleeding, Pengo et al.3 found that age >75 years was the only variable independently related to primary bleeding, and the incidence of major bleed was more frequent in the > 75 years (5.1%/yr) as compared to younger patients (1%)3. In the study by Hylek et al., the elderly cohort, in comparison to the younger population, had statistically significantly more risk factors for bleeding including hypertension, prior stroke, history of falling, and renal dysfunction. These differences were not adjusted for in the final statistical analysis. Also, in their overall cohort, 40% of patients were on aspirin therapy, and of the 26 major bleeding events recorded in their study, 46% occurred on aspirin. In a large randomized trial that compared the combination of low dose warfarin therapy (INR<2) and aspirin to aspirin alone in patients with a history of myocardial infarction, Fuster et al.4 found that the frequency of spontaneous major hemorrhage during the first year of therapy was increased to 1.4% in the patients on combination therapy compared with 0.7% in patients on aspirin alone (P=0.014)4. Therefore, the findings of Hylek et al. may have been confounded by the risk factors found in their population and/or concomitant aspirin therapy, as well as age. Overall, the Hylek et al. study contributes important information to enhancing warfarin therapy in patients with AF. For patients on warfarin therapy secondary to AF, the importance of appropriate assessment of risk factors for major bleeding and careful management at treatment initiation appears to be critical. The increased risk of bleeding reported by Hylek and others may be due in part to the recent increased use of concomitant warfarin and combination antiplatelet therapy in patients with coronary artery stents. Even so, it should also be recognized that the major bleeding rate of 4.7 per 100 person-years in even the younger patients in Hylek's report is substantially higher than that reported in other inception cohorts.5 Such a high rate of major bleeding raises the question of whether these results apply to other patient populations and/or other anticoagulation management systems. Kucher N, Castellanos LR, Quiroz R, Koo S, Fanikos J, Goldhaber SZ. Time trends in warfarin-associated hemorrhage. Am J Cardiol 2004 Aug 1;94(3):403-6. Flaherty ML, Kissela B, Woo D, Kleindorfer D, Alwell K, Sekar P, et al. The increasing incidence of anticoagulant-associated intracerebral hemorrhage. Neurology 2007 Jan 9;68(2):116-21. Pengo V, Legnani C, Noventa F, Palareti G. ISCOAT Study Group. (Italian Study on Complications of Oral Anticoagulant Therapy). Oral anticoagulant therapy in patients with nonrheumatic atrial fibrillation and risk of bleeding. A Multicenter Inception Cohort Study. Thromb Haemost 2001 Mar; 85(3):418-422. Fuster V, Califf RM. Randomized double-blind trial of fixed low-dose warfarin with aspirin after myocardial infarction. Lancet 1997 Aug 9; 350(9075):389-396. Chiquette E, Amato MG, Bussey HI. Comparison of an anticoagulation clinic and usual medical care: Anticoagulation control, patient outcomes, and health care costs. Arch Intern Med 1998; 158:1641-1647. *About the authors: At the time of this writing, Mr. Evang was a doctor of pharmacy student at Albany College of Pharmacy in Albany, NY and Mr. Wiegand was a doctor of pharmacy student at Temple University School of Pharmacy in Philadelphia, PA. Both also were trainees in the Anticoagulation Traineeship in San Antonio, TX administered by the American College of Clinical Pharmacy.